“Hello Mr. 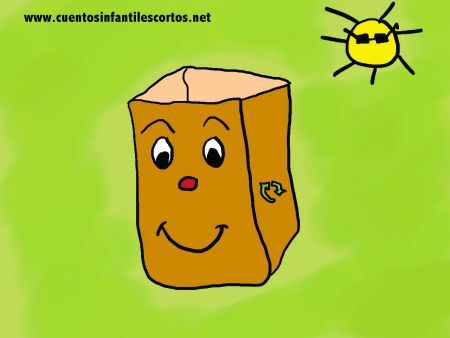 Manager, my name is Pappy and as you can see I’m a paper bag. I wanted to propose an idea to avoid using plastic bags in shopping,” Pappy declared. “What? Have you gone mad? Where else would people carry their shopping?” answered the manager, shocked. “Very simple,” smiled Pappy. “My plan is to replace plastic bags with paper ones like me, because we don’t pollute the environment. I’d also like to suggest something else: that we reuse both plastic AND paper bags instead of throwing them away straightaway,” Pappy went on, sounding very enthusiastic. “That’s not a bad idea, but why is it better to use paper bags and reuse them?” asked the manager, interested by what he what he was hearing. “Well, because firstly it would mean fewer plastic bags spoiling the environment. But it would also save us money, because we would be reusing all our bags without needing to buy new ones,” Pappy explained. The manager of the big supermarket realised that they were wasting resources, and that this could be avoided. So the following week, only paper bags and plastic bags were given out to the shoppers. Pappy went all over the world supermarket by supermarket, spreading his message that we should always re-use our bags, encouraging recycling and looking after the planet.